The first of two office towers to be built in the massive CIBC Square development in downtown Toronto is now almost fully leased. The 81 Bay Street tower is “plus or minus 96 or 97 per cent leased,” says Jonathan Pearce, executive vice-president, leasing, office and industrial, North America for Ivanhoé Cambridge. CIBC Square is being developed by Ivanhoé Cambridge and Houston-based Hines. Pearce made the comments a few days after the announcement Microsoft Canada will occupy 132,000 square feet over floors 41 to 44 of the tower, once it is completed in 2020 (see Microsoft moving Canadian HQ to Toronto’s CIBC Square). Another previously announced tenant, Boston Consulting Group, will take about 85,000 square feet of office space over two full floors and one partial floor in 81 Bay (also known as the South Tower). Lead tenant CIBC is leasing about two-thirds of 81 Bay and has also made a pre-lease commitment of about 50 per cent of 141 Bay Street, which will open in late 2023 or early 2024. The two 49- and 50-storey class-AAA buildings will total 2.9 million square feet when completed. Pearce says another leasing deal was completed this week for the 45th floor of 81 Bay and a “substantial” deal has been finalized with a tenant for between two-and-a-half and three floors, which should be announced in the next 30 days. Leasing for 81 Bay is arguably between two and three years ahead of schedule as new developments do not usually stabilize at 95 per cent leased until 12 months after opening, he says. 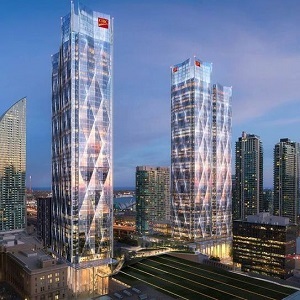 An elevated park over the rail corridor which will connect the two towers at the fourth-floor level is a “game-changer” and was “hugely important” to CIBC. “The idea of being able to have some green space in the heart of downtown Toronto is really something that nobody else can offer,” Pearce says. Green spaces are typically on the periphery in Toronto and landscaping at other triple-A-plus projects in downtown Toronto typically consists of planters, he says. Pearce says developers borrowed heavily from New York City’s Bryant Park as inspiration for the elevated park, which will be just over one acre in size. The firm which activates Bryant Park has been hired to organize programming. CIBC Square tenants will be able to access the elevated park from elevators. It will be accessible to the public via a “signature staircase” from the street at 81 Bay and a series of escalators and an elevator at 141 Bay. The privately owned green space will have a food and beverage component and can be closed for corporate events, ranging from meetings to yoga classes, he says. A “market-leading” food hall will not be “a typical subterranean windowless box” but will be “something that downtown Toronto hasn’t seen before” with high-quality, healthy food at various price points, he says. Typical fast-food chains will be accessible next door at Union Station, which will be connected to CIBC Square. He says a tenants-only fitness facility will deliver an Equinox Fitness-style experience. Pearce adds CIBC Square developers are talking about 141 Bay to a number of larger tenants looking for space six or seven years in advance. He expects interest in 141 Bay to increase from smaller tenants, who look only a few years in advance, once 81 Bay draws nearer to completion. Montreal-based Ivanhoé Cambridge is a real estate subsidiary of the Caisse de dépôt et placement du Québec, one of Canada’s leading institutional fund managers. Through multiple subsidiaries and partnerships, Ivanhoé Cambridge holds interests in more than 1,000 buildings and had assets of more than $60 billion as of June 30. Hines is a privately owned global real estate investment firm with a presence in 207 cities in 24 countries. The firm’s property and asset management portfolio includes more than 224 million square feet of space at 527 properties.